Wow, I'm so glad I read this book. It's definitely on my top favorite books list. 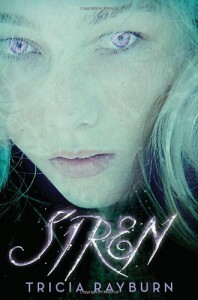 I'm even more excited that it's a trilogy because Sirendefinitely leaves you wanting to know so much more. I didn't think I was going to read this book in one day. I was really wrong. Right from the beginning I am so curious as to what is going to happen. It's one big mystery book and that's why I loved it so much. There was so much mystery that WASN'T predictable, there was summer love, and love for your family and friends. I was constantly guessing and that's why I had to read more. Vanessa is a great character. To me, she's mature for her age and doesn't play dumb. I love the fact that her and her sister Justine got along. I also liked that brothers Simon and Caleb got along as well. There's also another duo in this book which makes you really appreciate your own siblings and parents. In all, this book just really captured my heart and mind because love is so pure and the mystery just really puts that all in to place. The Cover: It's not my favorite and I believe the eyes should be silver, not purple which kind of bothered me.